Nick Swanson ’17 and a few fellow science majors are working to make a big impact in the lives of those without access to clean drinking water – all from the 2nd floor of the Science Center. Through the SJU Summer Scholars Program, I have been able to work alongside The College of Arts and Sciences Associate Dean Dr. Jean Smolen and fellow undergraduate researchers Anjni Patel, Nathalia Benavides, and Peter Carney on a project designed to help millions in underdeveloped countries who are subjected to highly toxic arsenic-contaminated drinking water on a daily basis. Although arsenic is a naturally occurring metalloid widely distributed in earth, air, and water, exposure to elevated levels of its inorganic form, mostly via drinking water, can lead to arsenicosis or chronic arsenic poisoning, which is commonly characterized by skin lesions and skin cancers. Prolonged arsenic-contaminated water consumption has also been linked to limb numbness, heart disease, diabetes, and partial paralysis. Natural or anthropogenic high levels of inorganic arsenic in drinking water is present in Argentina, Bangladesh, Chile, China, India, Mexico, Taiwan, and even some parts of the United States of America. Many of these affected locations have experienced arsenic poisoning as a terrible public catastrophe that is among the greatest of any disease our world faces today. Some communities could unknowingly be drinking 800 micrograms of arsenic per liter or parts per billion (ppb) in their drinking water due to its odorless and colorless qualities. Previously, the World Health Organization (WHO) advised arsenic levels in drinking water to be below 50 ppb until 2001 when it was changed to the current standard of 10 ppb. To combat the high levels of arsenic, some communities in the affected areas have received large, relatively expensive water filtration systems. Since price has been limiting further implementations of these costly filters, our main goal is to design a low-cost, slow-sand filter that not only removes the chemical contaminant arsenic, but also biological contaminants such as harmful bacteria. Building one of our filtration systems costs about $29.25 USD, whereas other filtration systems could cost thousands of dollars. The design simply includes two stacked 5-gallon plastic buckets, tightly-packed layers of gravel, sand, and iron nails, and a spigot attached for running the filtered water. Since all of these components can be readily found across the world at low cost, we can ensure that households around the world can reproduce this design within their means. Based on previous research, we have incorporated rusted iron nails between layers of sand because the oxidized form of iron in rusted nails has the proposed capability to remove arsenic from the contaminated water. Thus far, our results show that our hand-made filters have been able to reduce 300 ppb of arsenic-containing influent water to about 50 ppb, as well as reducing 60 ppb of arsenic-containing influent water to about 10 ppb, which the World Health Organization standards deem safe to drink. We continue to work toward the reproducibility and increased efficacy of arsenic removal to surpass the WHO recommendations for safe drinking water such that our design can be implemented in the aforementioned locations. Nick Swanson is a rising senior from Toms River, NJ. 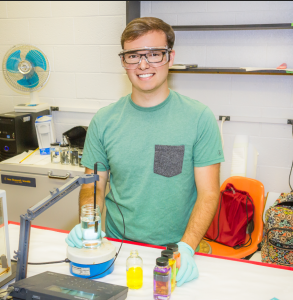 He’ll graduate with a Chemical Biology major with a Behavioral Neuroscience minor. Nick serves as the Inter-Chapter Relations Chair of Phi Sigma Pi National Honor Fraternity, Co-Director of Operations of SJU’s Dance Marathon, and a founding member of SJU’s chapter of Sigma Zeta Science & Mathematics National Honor Society.